By the title of this post, one would think I was actually building a closet. I so wish that were the case! I could use a new closet. Like a huge closet that was the size of a spare room. That is my dream! To buy a five bedroom house and turn the fifth bedroom into MY closet. Not one that I would share with anyone else in the house. A space that would be all mine. I would have an island in the center filled with my jewelry, scarves and other odds and ends. I would have a settee, a wall for just my shoes, shelving for handbags and a chandelier hanging in the center of it all. It would be a true celebrity closet! Until then, I am building my tiny closet with spring and summer essentials. 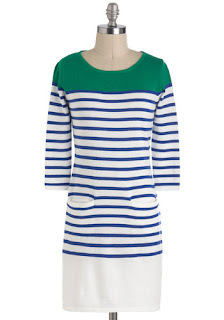 I previous blogged about some amazing pieces from Ann Taylor and from that post I now own pretty much everything! Okay, the only thing I don't own is the 3/4 sleeve top. 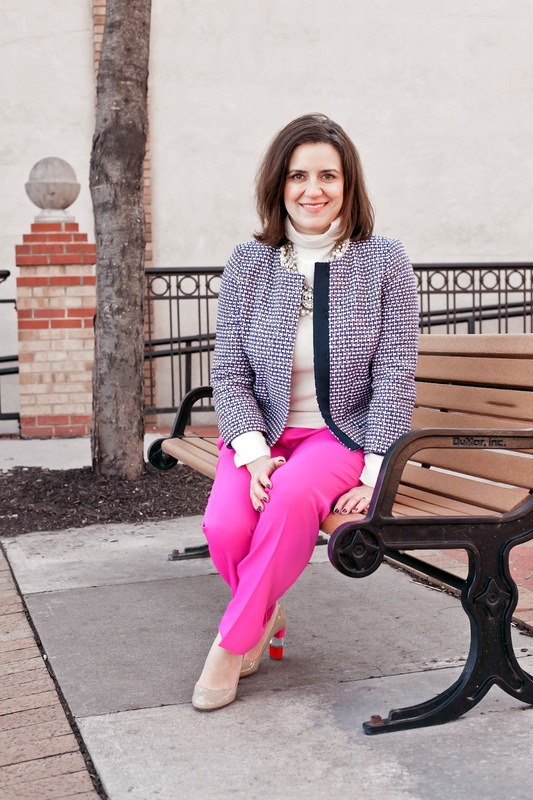 I wore the hot pink pants in Spring Looks Bright and I'm looking forward to wearing them again soon. With all this snow, over twelve inches, I can't get past Sportos, winter coats and gloves. These lovelies make me smile when I open my closet doors. Thank goodness for Twitter! If it hadn't been for Twitter, I would have missed a Tweet between bloggers that I follow and I would never have discovered this awesome button down from Anthropologie. I've been looking for a high/low button down and this one is perfect! 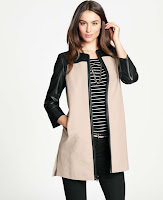 Light weight with 3/4 sleeves, it will be great alone or paired with blazers and cardigans or belted for contrast. Chunky jewelry and scarves will be great as well. I love a good basic! Printed denim is the new colored denim in terms of trends. Hang on to your colored denim, just make sure you add a little print as well. As it turns out, I already owned a pair of leopard print denim from LOFT that I wore all last spring and summer. See them here: 1/2/3. 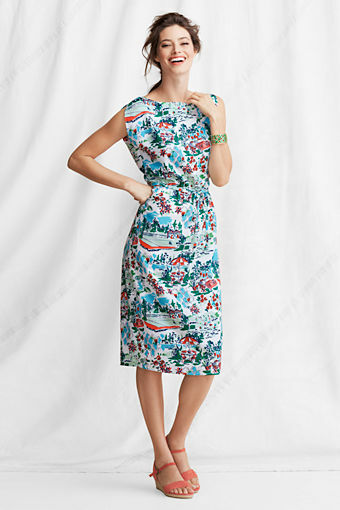 I added this colorful floral pair from Ann Taylor this past weekend! The possibilities are endless. They would look great with the button down above! Just add color with jewels or shoes. A colorful handbag would do that trick as well. Just make sure it's a solid. I may not have hit the purchase button yet, but I have been stalking this moto style jacket from Nordstrom for several weeks! I love the contrasting sleeves and the neutral palate of cream. It's perfect to throw on over t-shirts or camis with my favorite boyfriend jeans. A chunky sandal or sweet flat would compliment the look. Should I just go for it? Does this winter weather have you longing for spring? Don't wait for the snow to melt. 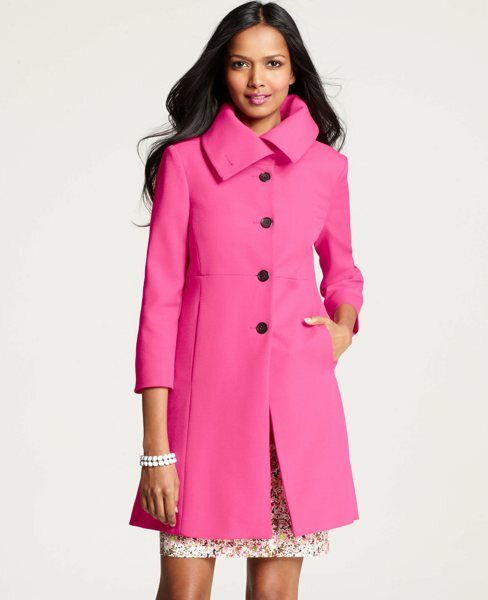 Start building your closet so you are ready when that first sunny, snow free day, is upon you! Photo of closet courtesy of Closets by Design. When I think about all of the fashion trends I've experienced through out the years, I can honestly say that I've tried to stay to true to who I am even while dabbling in different trends. However, I can say that there were looks that were NOT me at all but I wore them anyway. The 90s were not kind! Remember such trends set by Beverly Hills 90210 and Clueless? Not really something a Midwestern girl in her 20s should try to sport! 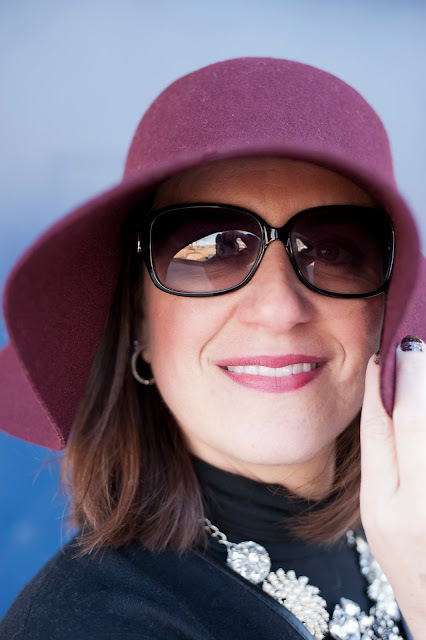 When I get down to the heart of who I am, style wise, I am a girl who's a little Mod 60s and Boho 70s. I love easy pieces that go dressy and casz, sequins for the same reason, and looks that are a little reminiscent of ladies who lunch at the Country Club in the late 70s. You know those ladies. They lunched pool side in dresses, crops, button downs and over-sized shades. At least that's how I envision them. 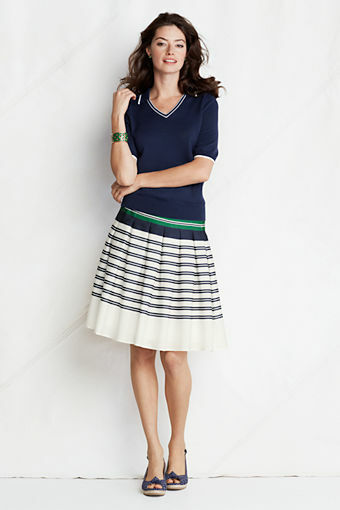 When thumbing through the latest Land's End catalog, I definitely got that Country Club vibe and couldn't get enough! I dog-eared my fair share of pages and then flipped through three more times to make sure I didn't miss anything. Then I took it over to my parents this weekend and showed my mom everything I loved. Seriously, couldn't get enough! With that being said, I am going to share a few of my favorites with you. I have become such a dress girl and that's not who I've been in the past. There is something so feminine about a dress and I'm learning how to wear them in different ways. These two are darling! And so simple to style. The little floral dress would be so cute paired with ballet flats or white tennies. 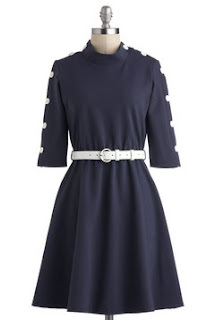 I would also switch out the self-belt for a thin one in a contrasting color. 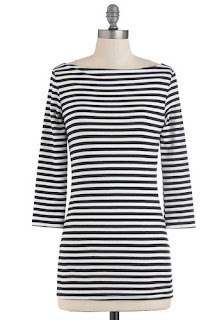 The polo dress is so easy to wear and perfect for work or weekend. I would pair this with tennies as well, or sandals for work, and throw on a thick belt to add definition. A denim jacket would be so cute over both for spring! 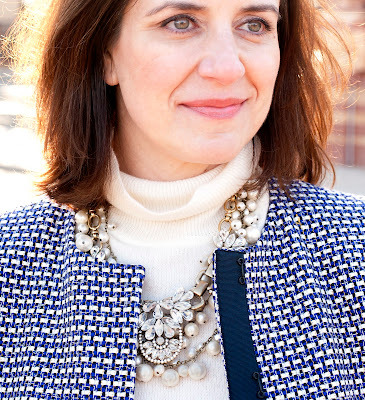 This cardigan screams Country Club chic! I love the green piping. I think that's what makes this sweater! Cute with khaki's but I would rough it up with boyfriend jeans and wedges. Cardigans don't have to be so serious! What look isn't complete without accessories. If you are heading to the club, you need a tote to carry all of your belongings. 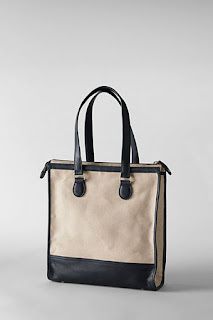 I love this linen and leather tote! It's also perfect for travel or when carrying all your other essentials during the work week. 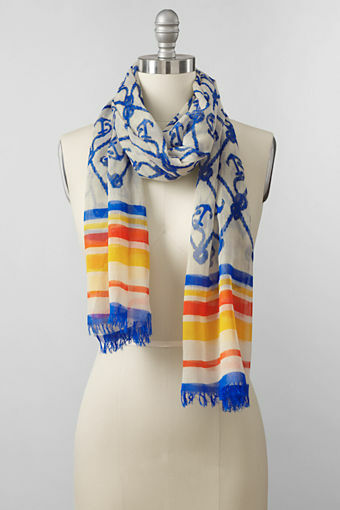 The scarf would make a perfect head tie, a huge trend for spring, and a look that is so Jackie O. It would also be great as a sash at the waist. Honestly, this is an Andrea look from head to toe. Okay, maybe not toe as I would be wearing my four inch pumps, but the rest of it is so me. A me that I have really moved away from since leaving retail. Over the last couple of years, I've tried to be edgy and on trend, but at the heart of my style file, this is the epitome of who I am. Super classic, super feminine and super cute! I've always been a huge fan of Land's End, but they have captured my excitement for spring in one little catalog! I can't wait to start wearing these looks. Now, if only the foot plus snow would melt! Last night we celebrated a dear friends birthday by having dinner with a small group. We haven't been out with a group in ages, and because of that, I felt the need to dress up! Plus it was Oscar Sunday and who doesn't want to dress up for that as well. 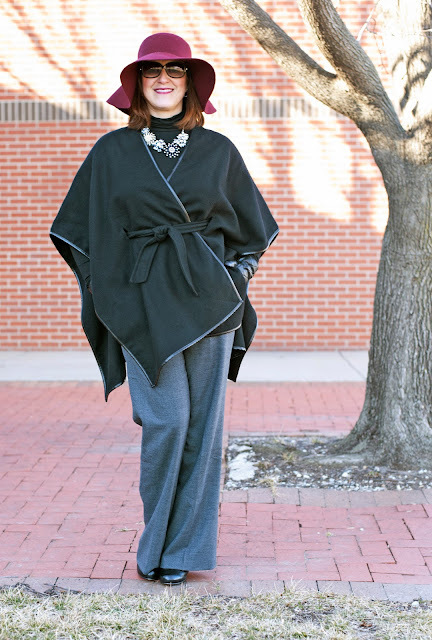 Rachel Zoe was the inspiration behind this look. 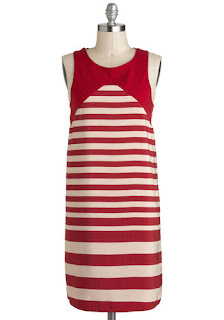 I blogged about it a couple of weeks ago but I didn't have the right dress in my closet. 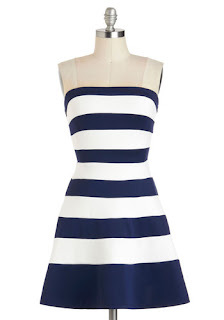 After days of online searching, I found the perfect dress at Piperlime! Photo of Rachel Zoe courtesy of Posh 24. Have you ever seen the film Anchors Aweigh? Actually, it's a movie musical starring Gene Kelly, Frank Sinatra and Kathryn Grayson. I love it! Set in the 1940s, two sailors are on leave in Hollywood. One wants to spend time with his girl, the other just wants to meet a girl. Guess who's who... Along comes Kathryn Grayson, who's character is an aunt to a little boy who wants to run away to join the navy. And, the girl that both men want. Very long story later, Gene Kelly's character falls in love with Grayson and they make movie history. I just adore this movie! What I adore even more are the costumes. Grayson's character, Aunt Susan, wears some of the most amazing pieces for that time period. Aside from vintage stores, you would be hard pressed to find such iconic pieces today. Until now! 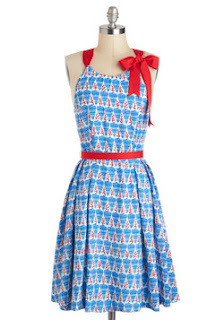 Enter, Modcloth. Have you heard of Modcloth? No? Well, allow me to introduce you. 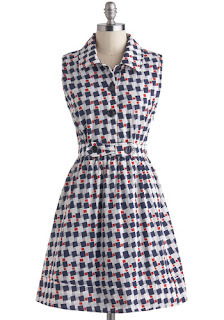 Modcloth is an e-tailer that specializes in vintage inspired clothing, as well as actual vintage pieces to boot. I have to admit, I've been a frequent browser of the site, but I've never actually made a purchase. It's not that I haven't wanted to. It's that the items sell out so quickly that I haven't had a chance to purchase something. I'm hoping that changes soon because today, something grabbed my attention and pulled me to their site. (Don't ask me what it was as I can't remember.) I'm so glad it did. 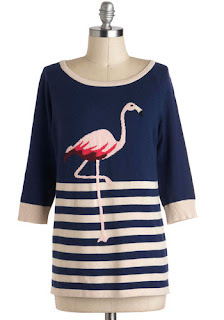 Their nautical collection is adorable and so on par with Anchors Aweigh! I have been taking vacations in my mind and planning wardrobes around them. I've thought about past trips to southern California and the beaches of the Outer Banks. How wonderful each coast is! Your surrounded by sandy beaches, ocean air, crashing waves and relaxation! And now I have the perfect wardrobe to pack! 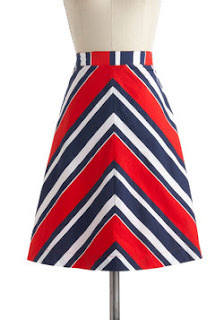 Seriously, could they feed more into my love of stripes? These dresses are darling! Flats, flipflops, Gladiators and tennies would be a perfect match! These tops would be darling with my beloved boyfriends but they would also be super cute with my new mint skinnies! Oh the possibilities! These dresses are so reminiscent of Lucille Ball, June Cleaver and Charlotte York-Goldenblatt. I adore the patterns, the cuts, the simplicity and the amazing details. I could seriously order every single one. Oh, except the darling strapless one because...it's sold out! See, I told you! I adore these full skirts! Such a far cry from the mini that's been on trend for so many seasons and I'm so thankful! I am not one for a mini because 1) they just aren't me and 2) they aren't really work appropriate. These, however, would look darling with a white tee and denim jacket. I would also pair them with a crisp, white button down and fun jewels. 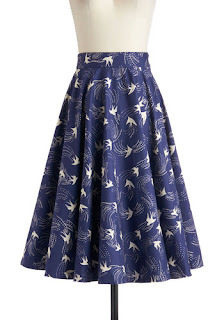 Now that I've turned you onto Modcloth, what would you purchase? I would love to style every single piece, if given the opportunity! Since that's a long shot, I will have to narrow down my pieces and ask myself, "What would Aunt Susan do?" Hello summer vacay! I spy with my little eye a look that I love! And, while taking photos, my dad told me he thought I looked like a spy! Love that! This all happened by mistake, which are looks I love the most! I've worn this cape so many times since receiving it for Christmas, yet I never get a photo. I've pretty much worn it the same way; skinny jeans, black turtleneck, chunky necklace and tall boots. That's how I planned to wear it earlier this week as well, but decided at the last minute to go with charcoal gray pants with a bit of a flared leg. I kept the whole look monotone with black boots and black turtleneck but still wanted a chunky necklace. I'm not sure what it is about this cape, but every time I wear it I feel a sense of uber chicness. 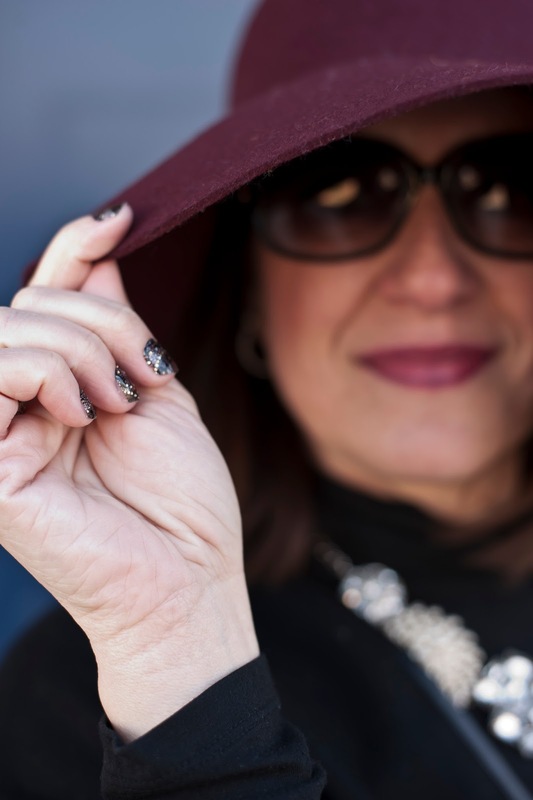 And what says uber chic more than sunnies and a huge, floppy hat! 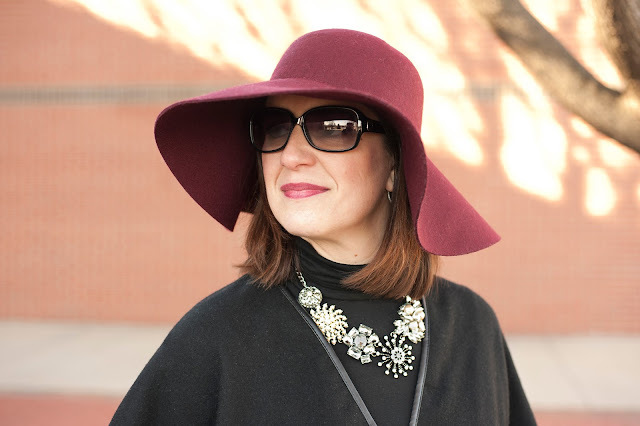 I love hats but I'm so afraid to wear a large hat like this only because some people may think "What is she wearing? Who does she think she is"? Well, I'll tell ya. I'm wearing this hat because it's such a statement and I think I'm a girl who can pull off a hat! As most of you know, I entered the Lucky Community blogger challenge for a chance to be featured on their Lucky Magazine home page. The rules were simple. Scour the pages of the March edition, find a trend(s) that you like, style them the way you want, take photos, blog about the look and enter. 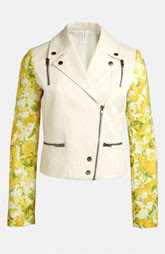 There are so many amazing things on trend for spring but I was really drawn to lace and brights. This was my brights look. 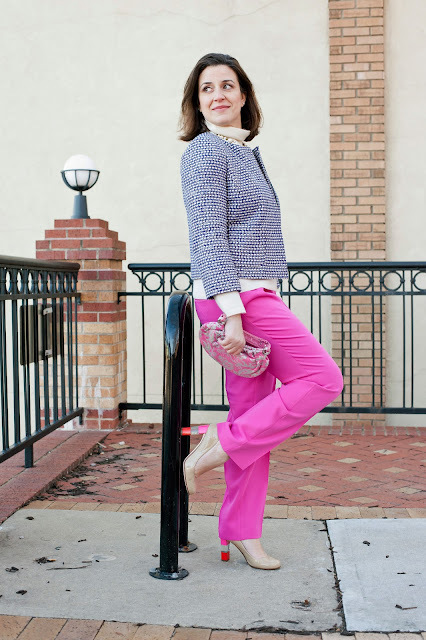 I am so happy that bright colors are trending for spring as I am not one to shy away from color! This bright pink pant is such a nice contrast against some of the drab colors currently hanging in my closet. I couldn't wait to start wearing them! I'll be honest, when trying to style them, I reached for as many bright tops as I could find. However, it was too much color. At the last minute, I grabbed this cropped blazer and....magic! I love the royal blue against the hot pink. And, it gives me an excuse to carry a clutch I didn't remember I had. Thank goodness for the organizational post a couple of weeks ago, huh? Don't be afraid to start wearing your spring colors now! Winter may be in full swing and so should your wardrobe. It really helped put a spring in my step, although my darling pumps didn't hurt! This past Sunday was a gorgeous day by February standards. Mid 50s and sunny so I decided the family needed a day out of the house. I don't know about you, but this winter has been really rough. It hasn't been a horrible in terms of weather. It just seems to have been a long one! I was definitely ready for an outing with the boys! We decided to spend the afternoon at the zoo, one of our favorite places to go. We have a beautiful zoo that's constantly growing. We now have two Polar Bears who we hope will have babies! Later this summer we are getting a penguin exhibit! So excited! McKinley is a blast at this age. He loved seeing the "amals" and would imitate the sounds of the elephants, gorillas and lions. Just a wonderful day! Even though it was in the 50s, there was still a chill in the air. I didn't want to wear a coat so I doubled up on sweaters. I layered a cashmere turtleneck under one of my favorite sweaters to date! This little guy is like a sweater and blanket in one! A perfect combo for the day. I added a hat as it was a dress and go kind of day. I needed to hide the day (or two) old hair! Sunnies hid the minimal, okay no makeup. We were outta there! I would say that a sweater of this nature is a definite investment. I wear it all the time. A great weekend piece that I wear over t-shirts, denim button downs and t-necks. It has also been a great piece for work. It will dress down a look when I have the need to look a little dressy yet casz!